La Boca, Cuba, is a small fishing village on the Caribbean Sea near Trinidad and Playa Ancon in the Sanctus Spiritus region. Spending just a day or even a few hours in La Boca is a nice break from the crowded tourist beach Playa Ancon, with its resort hotels, and from the heat and visual overload of Trinidad. Time spent in La Boca is both relaxing and refreshing. You also get more of a glimpse of the Cubans' Cuba, instead of the foreign tourist hubs. The village's beach, Playa del Rio, is rather rocky and doesn't match the white sands of Playa Ancon. But in the middle of the day, you may just have it all to yourself! La Boca, Cuba, does have a lot of casa particulars (private guest houses); so it's definitely ready for tourists. But on the beach, the little harbor and along the rocky shore, I saw hardly any foreign tourists. With the crystal clear water, partly fed by the river coming down from the mountains, and the amazing rock plateaus overhanging the bay, it seems like an ideal spot for fishing and snorkeling - or just watching the sunset. 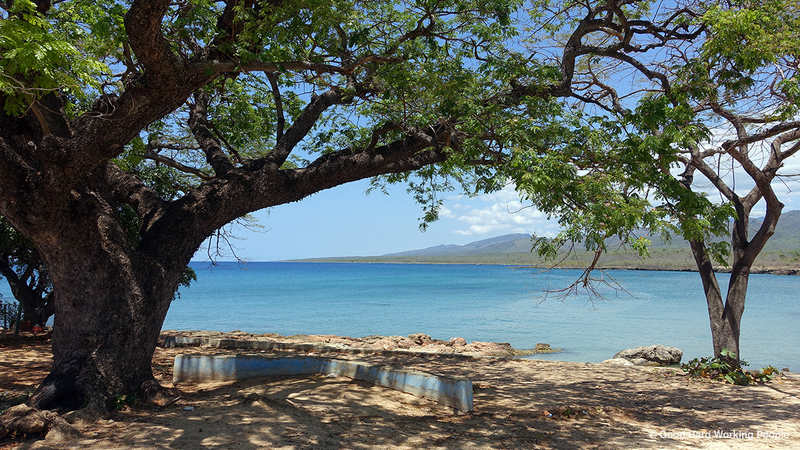 La Boca can be reached by bike or Classic Car Taxi from Trinidad or Playa Ancon. It's also a stop on the rumored hop-on-hop-off bus, which I waited for several times but never got to see. By the way, this video was shot in April during Week 313. I'm currently just stopping by Colorado for a few days between filming for my documentary "All's Well and Fair" in Florida and in Alaska. Not enough time to film something new. The song in the video is “Clouds” by Jason Shaw of Audionautix. He has made this and many great tunes available via a CC BY 3.0 license. Thank you so much, Jason!